A program Sharmen Wright is credited for initiating is the Take Five for Freedom Challenge. It is a fun way to get people reading the Constitution and Declaration. Everyone is busy with family and work and may not think they have time to set down and read the Constitution and Declaration of Independence. However, everyone could find 5 minutes in their busy day to read portions of those documents and the pocket constitution is the answer. 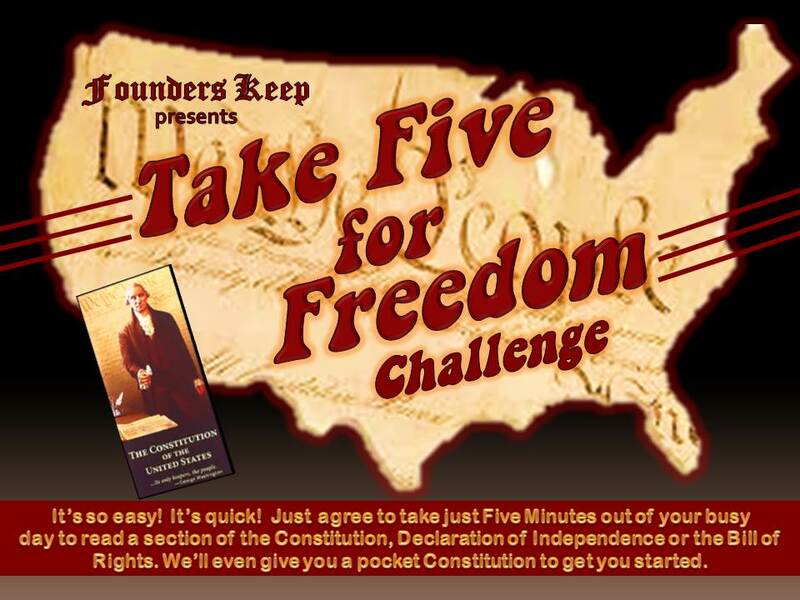 All you have to do is obtain a supply of pocket constitutions (we get ours from the National Center of Constitutional Studies – www.nccs.net). Then simply ask a complete stranger if they can tell you the five rights listed in the 1st Amendment. Nationally only 2% of the population can answer that question, but whatever their response you whip out a pocket constitution and show them where they can find the answer. Then tell them that you will give them, free of charge, that pocket constitution if they commit to taking only 5 minutes a day to read a small portion of it. It’s quick and easy.